The Short- Despite its cast and the recent success of Scott Derrickson, Deliver Us From Evil never gets past the creepy stage. A poorly written script with bulky dialogue delivered unconvincingly by a good cast, Deliver Us From Evil lacks the thrills, scares, and shock value that has made Derrickson a successful horror filmmaker. Deliver us from Evil is a ripped from the pages horror movie about NYPD Sergeant Ralph Sarchie(Eric Bana) after responding to a strange occurrence at the Bronx Zoo, Sarchie begins to feel the strain of a force beyond his control. Sarchie teams up with a priest (Edgar Ramirez) to find the root of the evil force and stop it before it harms the ones he loves most. Scott Derrickson directed and wrote Deliver Us From Evil which is based on the book by former NYPD Sergeant Ralph Sarchie. Derrickson’s star has been slowly on the rise since his 2005 horror flick The Exorcism of Emily Rose, Derrickson again brought the creepy factor to 2012’s scary children and snuff films scare fest Sinister, and is about to take on a Marvel film in Doctor Strange. Derrickson maybe was saving his better work for Marvel because Deliver Us From Evil is a poorly scripted horror film that grasps at creepy throughout but it’s lack of concise storytelling and clunky dialogue keep it from hitting genre high marks. It also doesn’t help that it’s not quite scary; it could be scary if it weren’t for predictable plot turns and a total lack of shock value that fans of Sinister had expected. The script written by Derrickson and Paul Harris Boardman is a strange blend of horror movie intensity and police procedural, except none of the characters have very much substance other than the two main characters and Joel McHale is wasted on crappy one liners and minimal personality. Again the biggest problem with Deliver Us From Evil is it’s not all that scary, at times Deliver Us From Evil is tense and creepy but never does it consistently scare. Deliver Us From Evil is an anomaly of mixed pacing and intensity, Some scenes had the opportunity to be unbelievably tense and others just flat out boring. As a horror fan I saw Deliver Us From Evil as one 2 hour missed opportunity, a chance to make a truly nerve jangling horror flick was left by the wayside. A scene in the Bronx zoo towards the start of the film could have been a classic horror sequence but its intense beginning is quickly thrown away when anyone opens their mouth. 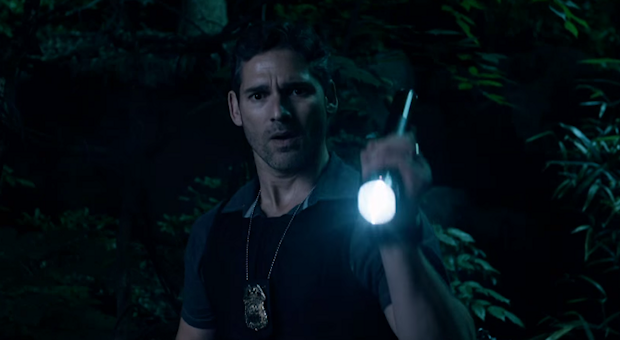 Eric Bana as Ralph Sarchie does a good job getting into character (a noticeably overdone NY accent is part of his charm) but even he isn’t given enough wiggle room to get out of lame uninspired horror sequences. Olivia Munn is wasted on a character that is given very little to do and the one scene where she is actually put into action is cut short. Edgar Ramirez’s Father Mendoza is meant to be a mix of Father Karras from the Exorcist and John Constantine but never does he reach the level where we care enough about him. Whether it’s smoking as he prays or getting hit on at bars, he is charming and his story is directly explained but he is still underdeveloped. The best acting in Deliver Us From Evil unsurprisingly goes to Sean Harris (Prometheus) who plays the films main villain. He rarely speaks and doesn't really have to but seems to have a devilish good time brooding and playing up his characters possession for the camera. Don’t get me wrong some scenes are wrought with tension and some of it really does work but a lack of consistent writing, and no deliberate pacing makes the film less scary as it progresses. Even if you cut Deliver Us From Evil down by a half hour (something you could absolutely do) it still wouldn’t have enough scares or characters we care enough about to actually be scary. What we are left with is a 2 hour horror flick with bad dialogue and a cliché title and sadly the scenes that do work don’t last long enough to be memorable. , but I do wish to discuss your udtresnanding from the topic. Youre truly well-informed. I cant believe just how much of the I just wasnt aware of. Thank you for bringing more information to this topic personally. Im truly grateful and really impressed. Starring- Eric Bana, Edgar Ramirez, Olivia Munn, Joel McHale, Sean Harris, Dorian Missick, and Olivia Horton.